Check out our quick-start guide to picking your ideal investment property, covering four essential criteria that should form part of every investor’s high-performance property search. Research is such an important step, yet it’s an area that a lot of gung-ho beginners tend to skip due to over-eagerness. Don’t make this mistake! Failing to properly research your investment is akin to flipping through the property classified blindfolded and pointing to a listing at random. There is a lot of information out there, and the best place to begin is with reliable, trusted property data sources such as Core Logic or the Australian Bureau of Statistics. These sources can help you identify trends and market conditions that will help your investment to prosper, such as the type of property that is currently in demand with tenants and owner occupiers; areas that are under-supplied; and suburbs that have extremely low vacancy rates. You can also look up the historical performance of various areas to better gauge whether a particular suburb is known for having stronger returns than others. Furthermore, it helps to have a decent understanding of the current economic landscape, taking into account things like employment trends, demographic profiles, market cycle and consumer confidence. There’s no way you’ll succeed in investing if you fail to create a proper strategy – one that’s known, proven and trusted. One that has helped others become wealthy through property. You may make a little money, accidentally, without a strategy – but if that’s the result you can achieve without putting any effort or thought into your property plans, then imagine what you can do with a clear and promising strategy? It’s not enough to have just a vague idea of what you want to accomplish; to be truly successful, the savviest investors out there have a comprehensive plan that details how they plan to get from A to B and reach their investment goals. An easy way to do this is to start by thinking over your short-term goals and writing them up into a five-year plan. The amount of money you have available to invest. The savings you’ve been able to accrue that can be dedicated to your property investment goals. How much time you have on your hands to give your property the right amount of attention. Your skills and knowledge of the industry. The wrong strategy can sabotage your wealth creation journey. After you have conducted your research and you have a solid plan in place, you can begin searching for your investment property. Since the location of your property will do 80 per cent of the heavy lifting, a good place to start is those suburbs where incomes are growing higher than the average for the state. This is usually due to local jobs and economic growth. Choosing somewhere close to facilities such as public transport, good schools, shopping centres, restaurants and the central business district is also important. Remember population growth doesn’t necessarily lead to price growth, especially in the outer suburbs where wages growth is minimal. Once you’ve narrowed down your location, the next thing to consider is the actual property itself. This is where you will ideally hit the pavement and start looking at properties inside and out. There are many “tricks of the trade” that real estate agents can use to make houses and units look bigger and better than they actually are – wide angle photo lenses, clever photography and “omitting” poor property features from the photos are just some of the tactics they can use to snare unsuspecting property buyers. Walking through the property yourself is the best way to ascertain whether it stacks up as an investment or not. Study it for signs of water damage, plumbing problems, uneven floors, walls and ceilings, formation of cracks, or gaps in brickwork. And don’t forget to take into account things like room size, natural light, ventilation, storage opportunities and car parking. These are all features that your tenants may value highly. It might be beneficial to get a building and pest inspector involved, as they can cast their professional eye over the property and give you a better idea of potential issues. Remember, two of the most important things to look for when you’re deciding to invest your money are strength and stability – and real estate has been proven to be a strong, stable choice over the long-term. Choosing the right property is crucial to your success, so dedicate ample time to this part of the process. Investing in property can be exciting and contagious, prompting you to act fast, but this is not the time to act hastily. Invest the time and effort now, and you’ll reap the rewards for years to come. 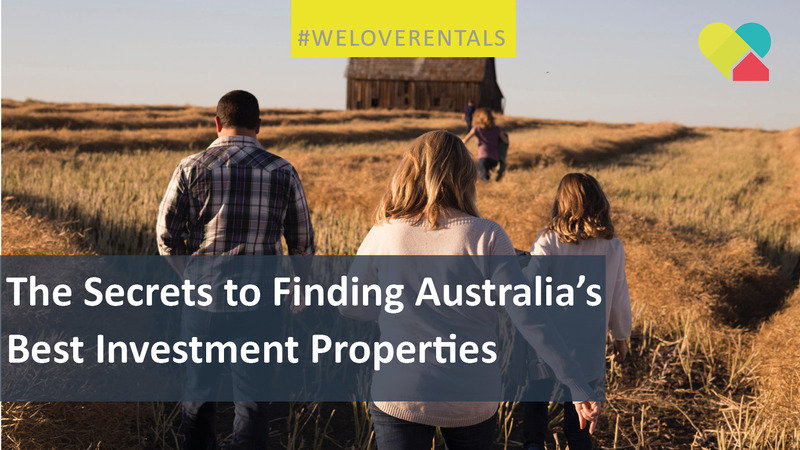 Once you have taken the leap and own your investment property, be sure to contact us here at We Love Rentals for Perth property management with passion.